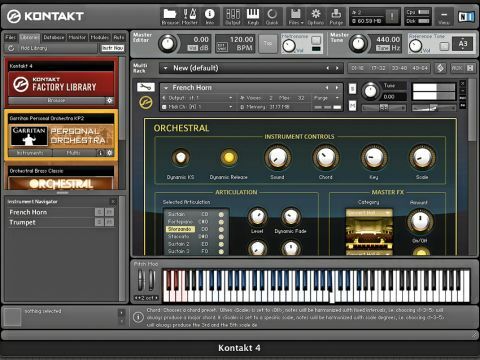 Kontakt holds on to its status as the champion sampler to beat, with the new features boding well for its future. Extensive pre-tagged library. New AET feature is promising. Lossless data compression option. Improved Performance View system. Extended convolution library. Can still feel complex. Only five AET patches. For those unfamiliar with Kontakt, it's a plug-in and standalone sampler for PC and Mac with a bundled library (43GB in the latest release). Over time, it's developed into one of the most powerful programs of its kind, and can deliver everything from simple mapped hits to full-on multi-layered, modulated, filtered and effected patches. Structurally, it can run up to 64 individual instruments within its multi-part framework, and uses a modular architecture and workspace for the addition of processing and effects. It includes a variety of sample playback modes, including RAM-based and direct-from-disk, and offers complex real-time timestretching/pitchshifting. It can import pretty much any sample format, including some original hardware sampler flavours (for example, it loads sounds from Akai CD-ROMs that are normally unreadable by your OS), and also supports loop formats such as Acidized WAV and Apple Loops. A few months ago, v3.5 surfaced, with a revamped sample playback engine, vastly improved multiprocessor support, enhanced ability to address large amounts of memory and enhanced MIDI learn options. These extras complemented the already impressive features added in version 3, such as instrument Performance Views, which enable the designing of graphical interfaces for Kontakt patches. One had to wonder where NI could go with v4, and inevitably, it's a combination of refinement and new stuff, with the most immediately obvious improvement being the upgraded Performance Views. What began in v3 as a neat idea has now really come of age, both visually and in terms of functionality. Each of the seven library categories has its own skin, but beyond this, features are instrument-dependent, ranging from ready-made EQ controls and playback randomisation to velocity response curves and one-touch, scale-specific chord harmonising. You can also select articulations for many of the orchestral patches. "The improved graphics and feature tweaks have given the library a genuine ROMpler feel." However, it's the Urban Beats category that we found most impressive, with its separate tabbed interfaces for hits, loops and the groovebox. The latter even enables pattern-style programming. We'll concede that much of this was in Kontakt 3. But the improved graphics and feature tweaks have given the library a genuine ROMpler feel, while retaining the full back-end flexibility. However, there's no simple way of combining the new or 'upgraded' sample content with that from previous versions - if you're upgrading, you'll be reinstalling sample content that you already have, which is a pain. You'll also find tag-based browsing, much like Kore, and 300 new impulse responses for the convolution processor. Existing users will welcome more subtle changes, such as the manually scalable interface window. On the sounds front, the bundled library is 10GB larger than Kontakt 3's and is now made up of seven collections: Orchestral, World, Vintage, Band, Synth, Urban Beats and Choir, the latter being the latest addition. This equates to over 1000 instruments and they come pre-tagged, so you can search by type, timbre, genre and so on. You'll also find a few escapees from discontinued NI products, such as Elektrik Piano, and some new VSL-sourced solo strings for the Orchestral collection, too. There are a couple of new technical features that should get producers talking. First is the inclusion of a lossless data compression format (NCW), which is said to achieve between 30% and 50% space savings. Although the library doesn't come ready compressed, Kontakt 4 can batch convert any existing library - a good job for a rainy afternoon. In use, there seems to be no additional CPU hit associated with using NCW, and the RAM preload is reduced, as you might expect. With NCW patches, we did find that some digital artifacts would afflict the sound near the maximum number of voices, but simply raising the voice limit alleviated this. The other big news is AET, or Authentic Expression Technology. Put simply, this combines an FFT filter module and spectral analysis to enable morphing from one sound to another (as opposed to simply crossfading between samples). In practice, this can be used to move smoothly between velocity layers of multisampled instruments, but more powerful is the option to morph between different sounds completely. "The bundled library is 10GB larger than Kontakt 3's and is now made up of seven collections." The manual has a thorough explanation of how AET works, and there are five patches in the Choir library that morph between vowel sounds (as heard in the audio demo below). Sadly, though, these are the only patches in the library that use AET. We spent some time working with AET and it's certainly impressive and arguably the way forward for multisampling. Even so, if you're a tweaker, you'll no doubt find plenty of creative ways to use and abuse it. And those who really like to go in-depth will appreciate the improved Script Processor, although we expect that this will see the most action in the hands of third-party sample library providers. Given the fairly recent v3.5 update, Kontakt 4 feels like less of a leap forward than it might have. Overall, the emphasis is clearly shifting towards usability rather than piling on more features, and given the immense feature set that Kontakt already has, this is a good thing. All in all, Kontakt retains its position at the top of the sampling tree, and although it can be daunting for new users, the improved Performance Views and attribute-tagged library let you forget about what's under the hood, if you want to. The big question for existing users is whether they should upgrade, as version 3.5 is still a perfectly good sampler. Thankfully, the upgrade isn't exorbitantly expensive ($149), but you might also want to check out the new Komplete 6 bundle, as there's currently a pretty attractive crossgrade available for users of all Kontakt (and Reaktor) versions, costing £263. 1. Choir morph. This patch perfectly demonstrates AET's capabilities and the harmonising option on the instrument. The first example morphs through the vowels, repeating with two harmonies. The next example morphs 'a' to 'm' followed by two extra harmony examples. 2. Key switching. 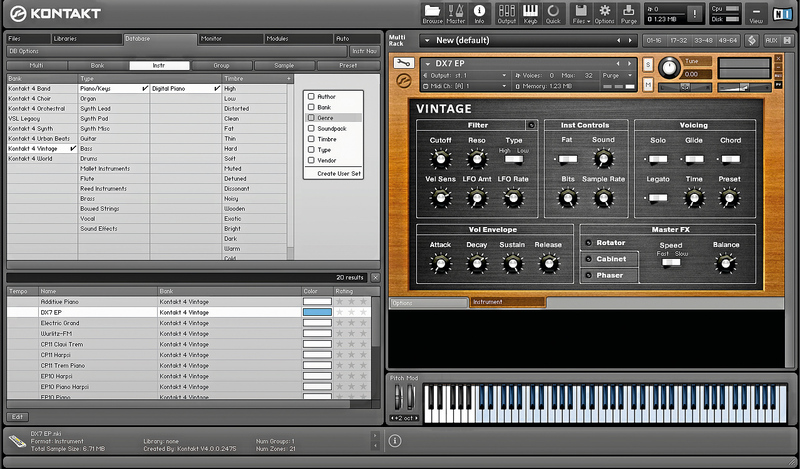 Many Kontakt 4 instruments feature key switching. Here we play through trumpet, French horn and tuba articulations. For the tuba we also hear dynamic key switches activated while the note is playing. 3. Urban Beats. 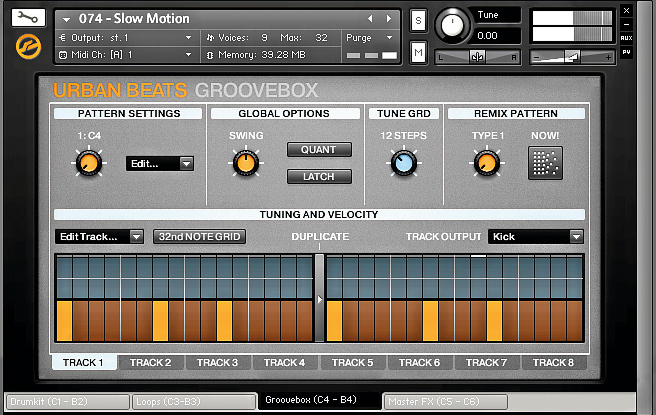 Using the Loony Tunes performance patch, we spin through the various loop and groovebox patterns, finishing by modifying the pattern on the fly. 4. Convolution. A DX electric piano with a selection of Kontakt 4's convolution effects.